U.S. citizens do NOT require a passport to travel between the U.S. and the U.S. Virgin Islands. The U.S. Virgin Islands offer an opportunity to experience the Caribbean in a comfortably familiar island paradise. USVI vacation packages appeal to anyone looking for that special mix of island adventure, idyllic scenery and sun-drenched, white-sand beaches. St. Thomas, once the refuge for the infamous pirate Blackbeard, features world-class resorts and some of the best golfing in the Caribbean. Most of the action is found in the capital, Charlotte Amalie, with its renowned duty-free shopping and nightlife. 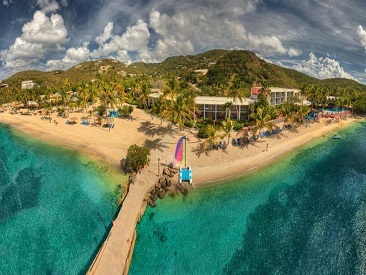 St. Thomas hotels are famous for their romantic atmosphere and seclusion, yet adventure is never far away in the most cosmopolitan of the U.S. Virgin Islands. From snorkeling, scuba diving and deep-sea fishing, to walks along a quiet cove; there is something for the whole family to enjoy with a St. Thomas vacation package. Explore one USVI island or all three! Each has gorgeous sugar-white beaches nestled in secluded coves with lush, tropical forests and flowering foliage everywhere you turn, along with magnificent diving, fishing, water sports for the entire family, duty-free shopping and friendly locals. They're your islands - experience them! Currently, the Tropic Tours' fleet of vehicles are unable to accommodate passengers that must be transported with a wheelchair or are unable to climb up or down the steps into their vehicles. Please Note: Due to damage caused by hurricanes Irma and Maria the following resorts will be closed through the end of 2018: Sugar Bay, Frenchman's Reef & Morning Star Marriott Beach Resort. Affordable, active beach resort situated on a 1000' stretch of palm-lined golden beach, the hub for endless activities on land and sea, day and night. Two popular restaurants and bars serve up a la carte specialties. Guests enjoy sailing trips aboard resort's 53' catamaran and on-site PADI 5-star training facility. All-inclusive plan available.